The Tennessee Wildlife Federation advocates and educates at the state and federal government levels for the conservation and sustainable use of Tennessee’s wildlife and the land, water, and air upon which it relies. To do so, TWF acts as a unified voice for all Tennesseans concerned with conserving the many natural resources that are abundant in the state. Conserving diversity of plants and animals, restoring wetlands, cleaning lakes and streams, and conservation education are just a few of the many issues TWF addresses on a proactive basis. TWF makes it a priority to maintain a high visibility on Capitol Hill and to constantly monitor proposed legislation to ensure our purpose of working for sound conservation practices. We want to make sure that Tennesseans — present and future — will have the opportunity to enjoy outdoor recreation and hunt and fish, and that those rights are not infringed upon. TWF also concerns itself with the activities of state agencies that impact the well-being of Tennessee’s natural resources. Open communication is maintained with the Tennessee Wildlife Resources Agency, the U.S. Army Corps of Engineers, the Tennessee Department of Environment and Conservation, the Natural Resource Conservation Service, the U.S. Fish and Wildlife Service, Tennessee Valley Authority, and other state and federal agencies that administer natural resource and environmental quality programs. Because of its positive attitude and practical approach to conservation issues, TWF’s counsel is eagerly sought by elected officials, members of state and federal agencies, and other leaders in matters concerning Tennessee’s natural resources. TWF recognizes the importance of natural resources in Tennessee and across the United States. We devote a great deal of time and energy to understanding how Tennessee’s wildlife and its habitats depend on one another and how governmental legislation will affect those relationships. Our goal is to ensure that future generations will enjoy the same benefits of sound conservation practices we enjoy today, benefits such as clean water and air, land for outdoor recreation, and the ability to observe our native animal species. Become a champion on behalf of Tennessee’s wildlife and natural resources! 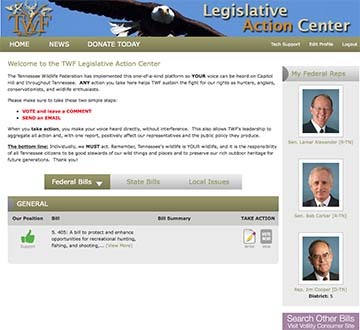 CLICK HERE to create your own account at our Legislative Action Center for communicating with your representatives about Tennessee’s great outdoors — it’s quick and easy! Have a question or comment related to a conservation policy matter? Email policy@tnwf.org to communicate with TWF leadership.